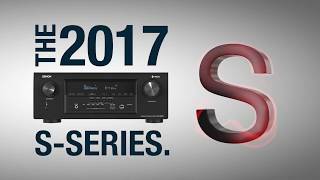 Featuring high current discrete power output devices on all channels, the AVR-S730H delivers high power and is rated at a maximum of 165 watts per channel. There's also an Auto Eco mode that adjusts the maximum power available according to the volume level as well as an on-screen Eco meter that lets you see the power consumption reduction in real time. For compatibility with the widest range of loudspeakers the AVR-S730H is equipped with low impedance drive capability that provides operational stability with 4 ohm speakers. The HEOS app ensures multiple music sources are always ready to play on the AVR-X6300H – or any devices on your HEOS network! Enjoy music from Pandora, Spotify, TuneIn Internet radio, Amazon Prime Music, iHeart Radio, Sirius XM, Sound Cloud, Tidal, Napster or Deezer (*), or use the HEOS app to stream one song or a whole album from your phone, USB stick, or computers and NAS drives on your home network. Whatever you want to hear, access it directly from the HEOS app, complete with support for favorites and playlist functions. With AirPlay 2 you can enjoy listening to your favorite tracks wirelessly from your favorite iOS device including the iPod touch, iPhone and iPad.